ConceptDraw DIAGRAM is a bundle of the vector stencils, examples, and templates for drawing quality diagrams. Value Stream Mapping solution is a Lean Manufacturing tool that uses a flow diagram to document in great detail every step of a manufacturing process. This graphical representation of a process is a powerful tool that helps in the diagnosis of process efficiency and allows company to develop improved processes. Pic.1 Value stream mapping (VSM) sample. This example of a Value Stream Map diagram was drawn using ConceptDraw DIAGRAM with the Value Stream Mapping solution from ConceptDraw Solution Park. 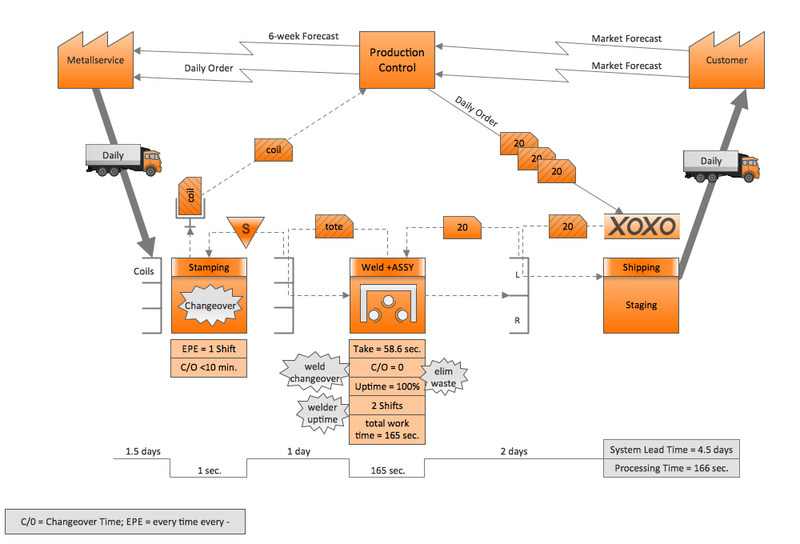 Value Stream Mapping for the lean office is a tool that uses a flow diagram to document in great detail every step of a manufacturing process.